Our advisors are doing great work around the world! 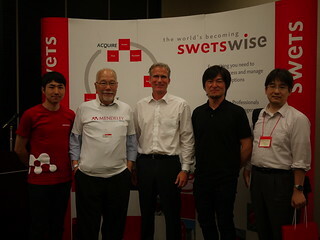 Our Mendeley Advisors have been doing great work all around the world. We’d like to recognize them with this post and to let you know that if you have questions about Mendeley, you can reach out to your local advisor for help. Smithsonian Center for Astrophysics (CfA) Head Librarian and Mendeley Advisor, Chris Erdmann was kind enough to lend out the super-cool Collaborative Space (complete with Wii) @ the Wolbach Library for a Boston Advisor & Librarian Meet-Up and separately organized a demo for the Institutional Edition with all of Harvard’s key librarians. Philip first introduced Mendeley to his fourth-year students by creating a public group to share papers for their team projects. Throughout the term the Mendeley group became central to the students’ learning as a space where they contributed additional papers, references and notes. 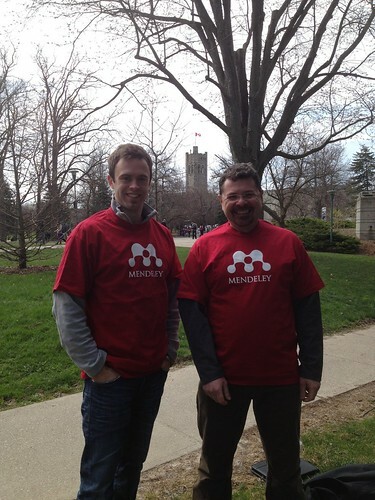 Philip also introduced Mendeley to his first-year undergraduate students. He offered an initial introduction to the tool at the beginning of the term and invited his students to join a public group he dedicated to the course. Throughout the semester, whenever he mentioned an article during class, Philip added it the Mendeley public group so that the students were able to locate it quickly and easily. At the end of the term, feedback indicated that nearly 40% of his first-year students intend to use Mendeley in their courses next year. Justin and Dillon (not pictured) are both Advisors from UWO in Ontario Canada. They organized a strategy session at the University of Western Ontario with their local Swets representative to discuss the MIE and Mendeley usage on campus. Dr. Bamaiyi is a PhD Scholar at the Universiti Putra Malaysia and he’s been a Mendeley Advisor since Feb 2012. 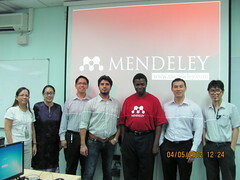 Dr. Bamaiyi is a self-proclaimed “Mendeley Zealot” hosting workshops and demo’s throughout Kuala Lumpur, Malaysia. Since becoming an advisor, he has organized over 10 presentations at various universities all over KL and partnered with local Swets representative to meet with librarians at universities all over Kuala Lumpur. Do you want to be a Mendeley Advisor? Sign up here. An interview with the founders of PeerJ, an innovative new academic publishing startup. Is anyone in Cambodia or Vietnam? If so I’ll be in the area of Siem Riep for the summer with short trips to Vietnam. Would be great to connect! I would like to personally say good job to Philip Fowler. He’s done some good networking for Mendeley. Networking like he does is exactly what he should be doing to provide students with top of the line software to keep them ahead of the game.